According to my mother-in-law, this is some type of willow tree. We noticed little red berries on it today. Do you have a picture of the berry?? I don’t think it is a williow if it has a berry but not sure. I agree with TumbleWeed, it’s not a willow. Hard to tell from a distance, perhaps a weeping cherry? red berries: hmmm not a mulberry tree is it? I have to agree with truthiness. I think it is a weeping cherry. It does weep, but the leaves are not the right shape to be willow, and I am also pretty certain that there are no mulberry trees with that shape of leaf. 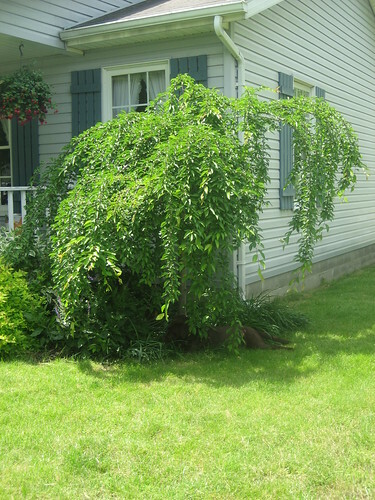 Here is a link to a picture of a weeping cherry, and I think that it looks exactly like yours. I agree it looks like a weeping cherry. Willows, especially weeping, will be fairly spindly at that size and the leaf size is much smaller and elongated.